For helpful legal advocacy and advice in your criminal defense, family law or immigration matter, contact Richards Law Office. Headed by attorney Erin C. Richards, the law firm serves Glenwood Springs, Colorado. Even if you have been turned down previously for an adjustment of status, Erin C. Richards can help you fight to keep yourself and your family in this country. It is understandable to feel frightened or hopeless after an arrest, but remember that you have legal rights. As your criminal defense law firm, Richards Law Office will help you stand up for your rights, such as the protection against illegal search and seizures. Erin C. Richards is a skilled defense lawyer, and does everything in her power to keep her clients out of jail. 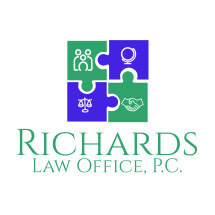 If you have been wrongfully charged with a crime, call Richards Law Office as soon as possible. Your choice of attorney matters. Choose a lawyer with the ability and understanding to get things done.